This book explores the multifaceted aspects of India’s energy security concerns. 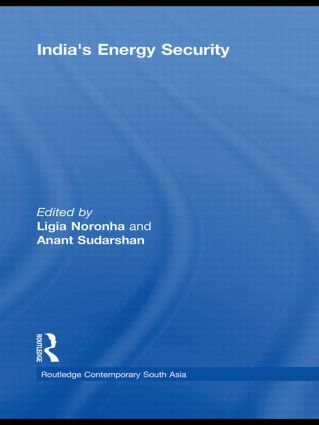 Bringing together a set of opinions and analysis from experts and policymakers, it sheds light on the context of India’s energy insecurity and explores its various dimensions, its nature and extent. Contributors examine the role that trade, foreign and security policy should play in enhancing India’s energy security. It is argued that the key challenge for India is to increase economic growth while at the same time keeping energy demands low. This is especially challenging with the transition from biomass to fossil fuels, the growth of motorized private transport, and rising incomes, aspirations and changing lifestyles. The book suggests that at this time there are strong arguments to lessen the fossil fuel path dependence and it argues for a need to engage with all the key sources of this dependence to implement a process of energy change. India’s Energy Security is a timely contribution given the national and international interest in the issue of energy security and the possibility that energy concerns have the potential of becoming the cause of serious international conflicts. It will be of interest to academics and policy makers working in the field of Asian Studies, Energy Policy, International Relations and Security Studies.